Space infrastructure has the potential to revolutionize the way in which engineers conceive, design, and operate space missions. Federated Satellite Systems is a radical breakthrough developed by researchers at the Skolkovo Institute of Science and Technology in Moscow, as well as at partner institutions abroad. Think for a moment how our world would look if there were no infrastructure. For example, without roads, or train systems or air networks, we would not be able to travel far from our homes. People would remain isolated in their small towns, much like life was before the 19th century. Space technology, however, remains stuck at the stage where there is little infrastructure. My research group is an international team based at Skoltech in Moscow, and it is composed of graduate students and researchers from Russia, Europe, and the United States. We envisage a future for sustainable and effective infrastructure in space, and so we are developing Federated Satellite Systems (FSS). This will be the next revolution in the design of space systems. 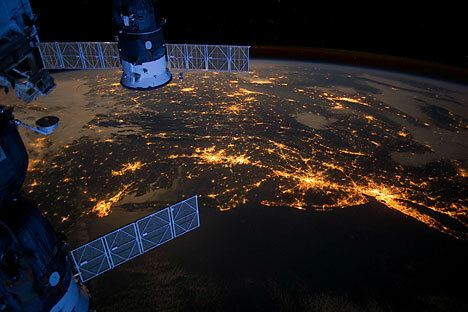 The past two decades have seen the creation of vital orbiting infrastructure, such as the GPS satellite constellation that we use in daily life to search for an itinerary on our electronic car navigator. Satellite support systems have been launched, such as the American Telemetry Data and Relay System (TDRS), and the European Data Relay System (EDRS) that is currently under development. Yet these systems face severe limitations due to a variety of technical and economic reasons. For example, data needs cannot be satisfied by existing in-space infrastructure for most satellites flying in Low Earth Orbit (roughly 800 km from Earth’s surface), as well as for small satellites developed by industry, research centers, and universities. In addition, there is no in-space infrastructure today that is able to generate, store, and supply electric power to customer spacecraft. Today, most satellites must generate electric power on-board, and they need to have their own telecommunications equipment to contact Earth. Small satellites need to process and store all the data produced by their instruments, as no support facility is available. Launching satellites comes with a hefty price tag of several thousands of U.S. dollars per kilogram. Often launch costs are a very substantial fraction of the costs of the satellite itself.One would expect that satellites, since they are expensive to place into orbit, would be engineered to last for a long time. And this is definitely the goal of large missions. However, partial and sometimes deadly satellite system failures are common in space operations, no matter how capable or large the satellite. If the instrument of such precious craft would fail for any reason – be it space debris collision as in Alfonso Cuarón’s Gravity movie, or a deadly space radiation event coming from the Sun – then the entire mission is lost. Supporting orbiting infrastructure would allow engineers to design lighter, cheaper, and ultimately more capable spacecraft. It would allow them to give new life to partially failed satellites, by repurposing their mission in a way that will make use of their functioning capabilities. We will enable this unprecedented opportunity with the development of Federated Satellite Systems. FSS is a revolution equal to what Uber/ Yandex Taxi and Zipcar have done for the taxi and personal transportation industries. The revolution is the idea for spacecraft to share capacity with neighboring satellites on an opportunistic basis – capacity being instrument time, or data relay capability – only when the transaction makes sense. This will increase value for both the giving and receiving parties. This simple and powerful concept is at the basis of market transactions in microeconomics theory. It can be applied to space engineering and space operations as well. With this idea, we allow the establishment of a self-growing infrastructure in space, made of a balanced combination of supplier and customer spacecraft willing to share. We envisage the inclusion of dedicated providers – startup ventures launching service satellites operating in a federation for pure economic profit. We foresee that this concept will have a snowball effect with the evolution of the satellite federations, much like the adoption of new technology such as smart phones or tablets in the consumer market. We base our studies in FSS on existing concepts, such as peer-to-peer networks, interplanetary internet, and sensor webs that have been proposed in the past. Yet, our innovation relies in our commercial thinking and the ideas of opportunistic resource sharing, which make our concept unique. We found partners on our way, for example, prominent researchers working on the FSS concept at the Massachusetts Institute of Technology, and other universities around the world have embraced our vision as well. In FSS’ initial operational stage, we will have to deal with the same problem faced by Bell when he invented the telephone: Who will buy the first unit, when there is no one to call? Therefore to enable their potential, satellite federations will need initial space missions acting as sponsors. This and other issues have been faced and solved by various breakthrough inventions in the history of our civilization, such as the airplane or the telephone. We are confident that we can make it happen in the future of satellite federations as well.